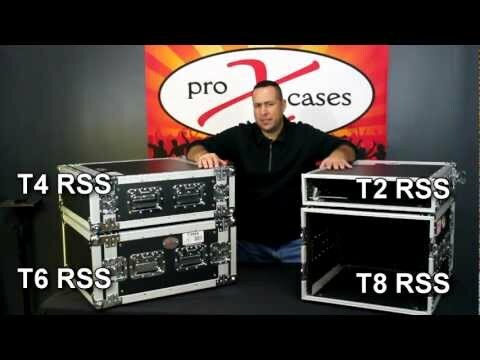 The T-18RSS 18 Space 18U vertical amplifier rack case is the perfect storage solution for convenient security for a wide variety of amplifiers, pro DJ mixers, effects and any other standard 19" rack-mountable pro audio/DJ/Network gear. Built with a heavy-duty construction design and dual mounting rails your equipment won't dislodge or slip, and strain on the rack ears will be minimized. These professional-grade products also include external spring-loaded handles and butterfly twist latches with included padlocks for added security. The rubber feet at the base will ensure maximum stability when stacking multiple units. As part of ProX Cases Signature Series line of products, the T-18RSS case is assembled with thicker 3/8" plywood for premium protection. In addition to the heavy duty design and convenient features of the T-18RSS, this case is coated with a beautiful black finish giving you a stylish, durable, and dependable product that will last a lifetime.